The Supplemental Nutrition Assistance Program (SNAP) is the largest of the U.S. Department of Agriculture's Food and Nutrition Service domestic food and nutrition assistance programs and the centerpiece of national policy to alleviate hunger and poverty. Nationally, 83 percent of those eligible for SNAP received benefits in 2014, according to a new brief written by researchers at Mathematica Policy Research. Furthermore, about 70 percent of the eligible working poor—people living in households where someone earned income for a job—participated in the program, according to the study, conducted for the U.S. Department of Agriculture's Food and Nutrition Service. The brief also reviews state participation rates, which varied widely. Oregon likely had a higher participation rate than other states while Wyoming likely had the lowest rate, at 59 percent. Regionally, the Midwest had the highest participation rate—94 percent—while the Western region’s rate of 73 percent was significantly lower than most other regions. States with high participation rates for working poor people included Iowa, Maine, Michigan, Oregon, South Dakota, Vermont, and Wisconsin. California and the District of Columbia had lower rates for working poor people than most states. State rates fluctuate over time for a variety of reasons. 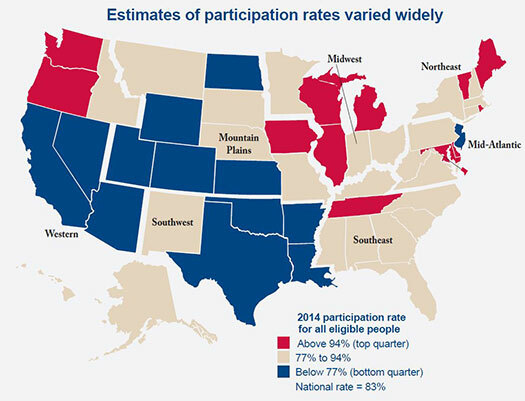 From 2012 to 2014, a few states—Delaware, Maine, Michigan, Oregon, Tennessee, Vermont, Washington, and Wisconsin—had significantly higher participation rates than other states. On the other hand, California, Kansas, Nevada, New Jersey, North Dakota, Texas, and Wyoming had significantly lower rates than most other states over the period. "Through SNAP, the federal government ensures that its most needy citizens have access to nutritious food," noted Karen Cunnyngham, associate director at Mathematica. "States can use the data in this brief to assess program performance and develop strategies to enhance access." SNAP, formerly the Food Stamp Program, is the largest of the domestic food and nutrition assistance programs administered by the Food and Nutrition Service and a central component of the national policy to alleviate hunger and poverty. Mathematica has analyzed SNAP participation rates for more than two decades. Read the full report, “Empirical Bayes Shrinkage Estimates of State Supplemental Nutrition Assistance Program Participation Rates in Fiscal Year 2012 to Fiscal Year 2014 for All Eligible People and Working Poor People,” by Karen Cunnyngham, Amang Sukasih, and Laura Castner. Learn more about Mathematica’s work in data analytics and nutrition.